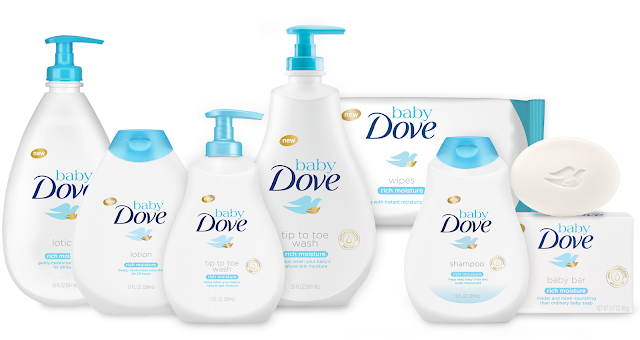 Dove, a very common bath and body brand has recently released a baby product line called Baby Dove . As my 1 year old son Milo has the most sensitive skin ever, I am always looking for products that will help ease the side effects of his sensitivities. I love Dove products for myself and even use some of their products on a daily basis. So when they launched their baby range I was eager to try it out. Here are my thoughts on the Baby Dove Rich Moisture Tip to Toe Wash and Lotion. Price - Depending on the retailer you choose to purchase from you can find this new Baby Dove range anywhere between $5.00 - $9.00 a piece for the tip to toe wash and lotion. The other products in the range vary in price such as the baby bar and wipes. It's not as expensive as Burt's Bees Baby or California Baby but more comparable to Aveeno Baby and Shea Moisture Baby . Quality - The rich moisture line has the recognisable scent of Dove products. Very fresh and clean, I am very fond of the smell on Milo. It's more gender neutral than most baby products as well. Milo often times leave the bath smelling like a little girl, but with Baby Dove it's just more a fresh fragrance. The lotion is a bit runny for what I was expecting from something labeled "Rich Moisture". For Milo's eczema prone skin I would use this more as a daily moisturizer rather than something rich and soothing. The wash lathers nicely and is very creamy. I like the wash much better than the lotion. Convenience - Having a full range of products from wash to lotions to body bars and wipes makes the Baby Dove range super convenient. It's nice not having to brand flip when it comes to all those necessary baby products. So if these products are compatible with your baby it makes life easy when you can have all your baby needs met by one brand. Design - I really like the packaging of these products. Chic, classic and falls in line with Dove's theme in their branding. Having a cohesive product design makes for more recognisable branding. Dove is notorious for keeping their branding simple and crisp. I am a firm believer that there's a sophistication in simplicity. Accessibility - These new Baby Dove products can be found pretty much anywhere other Dove products are sold, which is everywhere. Supermarkets, drugstores, department stores, and all sorts of various online outlets. This makes it super easy to pick up while running other errands, traveling, or ordering online through your normal outlet such as Amazon or Walmart . If I am being honest as I most often am, it's kinda what I'm known for, I probably wouldn't make these items a regular purchase. Milo currently uses Aveeno Baby and those products are rich enough to soothe his ultra dry sensitive skin. Baby Dove doesn't seem to be strong enough for him. However, if your baby doesn't have such harsh sensitivities and dryness then I would actually highly recommend this range. It's gentle, accessible, and smells amazing. Just not rich enough for a baby prone to eczema. Maybe one day Baby Dove will launch an eczema line with their baby range. If so I would be stoked to give them another chance. I didn't know dove had a baby line. I live in UAE and never found in any stores here. Would like to try my hands on one once its available here.